Take your game to the next level at Salem Ridge Golf & Academy. Discover a state-of-the-art practice facility home to Canada’s finest teaching Professionals. Get to know YOUR clubs, YOUR golf swing and YOUR abilities by working closely with one of our PGA of Canada Pros who will teach you how to master YOUR game. 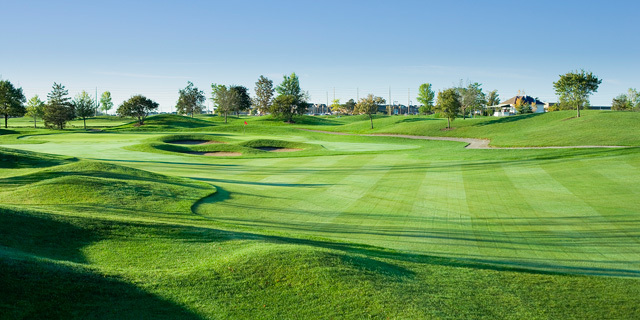 Practice like the pros and improve all aspects of your golf game with bent grass tee decks, target greens, Short Game Practice area and dedicated Putting Green. Now you can put those skills to the test on Salem Ridge’s 9 Hole Executive Golf Course - This challenging yet forgiving course is well conditioned and always enjoyable. It only takes about 90 minutes to play, so it’s easy to get a round in.